Swallowing capsules versus pills « Howard J. Bennett - Pediatrician and Author in Washington, D.C. This is a simple tip, but one that makes a big difference when you have to take a medication for 10 days. 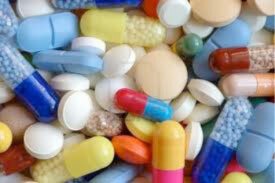 The basic difference between capsules and pills is that capsules float and pills sink. If you put a capsule in your mouth, take a sip of water and throw your head back to swallow the capsule, it will be hard because the capsule will float on the water and move away from the back of your throat. The best way to take capsules, therefore, is to take a mouthful of water, put the capsule in your mouth and then lean your head forward as you swallow. When you do this, the pill will still float on the water, but now it will be at the back of your mouth and go down more easily. Because tablets sink, the best way to swallow them is with the opposite maneuver. Take a mouthful of water, put the pill in your mouth and lean your head back when you swallow. If you have trouble swallowing pills and capsules, I discussed a trick for doing this in an earlier blog. ← Is it good idea to know your blood type?